LEWISTON, Maine -- To aid relief efforts in Haiti, the Bates College Department of Athletics has undertaken an initiative to raise money among its staff members and student-athletes and beyond. "Since financial contributions appear to be the best way to help at this point, it seemed prudent to join an effort that has started gaining momentum amongst college athletic programs," said Director of Athletics Kevin McHugh. "It is a 'pay it forward' idea in which each student-athlete and athletics staff member is asked to contribute a minimum of $1.00 toward the relief effort and then also to secure three more people who will donate by going to http://www.redcross.org or sending a text message and who will each ask another three people to donate, etc." McHugh is requesting that each team's captains, as well as the teams' representatives in the Student-Athlete Advisory Committee, collect funds as soon as possible from teammates and get the money to their head coaches by the end of this week. "If all of our athletes and coaches make a donation of at least $1.00, we will have a foundation of $500 which will be the basis for an additional appeal this weekend to the fans at all of our home athletic contests," said McHugh. "Hopefully, that will double the initial $500 so that we can make a sizable contribution to the aid effort." Colby has come together under the leadership of Goldfarb Center Student Advisory Board students to raise money for the Stand for Haiti Campaign of Partners in Health, which is working to provide medical care for the victims of Haiti’s devastating earthquake. This effort has truly become a community undertaking. The Goldfarb SAB and many other student volunteers have been supporting this effort. We have been giving away donated t-shirts for contributions of $10 or more and have so far raised over $4000 in the first four days of these contributions. However, we are all very aware that the needs of Haiti will not end in a few weeks; thus our efforts will continue and grow into the next semester. On February 26th, the Center will host a Haitian Relief Benefit, a community dinner and a silent auction. Partners from throughout the Colby community are supporting this effort; Sodexho, Colby’s dining services provider, is providing the food at a reduced cost; sports team members will service as waiters and waitresses; and we have received College support through the President’s Office to defray the additional expenses so that all of the money raised will go directly to Haitian relief. A number of local businesses and friends of the Goldfarb Center have volunteered as corporate sponsors for the event or are donating items for the silent auction. Individuals and businesses interested in attending or being a corporate sponsor should contact one of the two students who have taken the lead for the Center in this terrific undertaking, Lisa Kaplan or Danny Garin for further details. 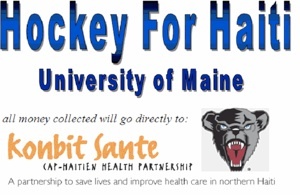 Tickets cost $40 and are available by contacting Danny Garin, co-chairman of the Colby College Godfarb Haitian Relief Effort a dfgairn@colby.edu or 202-360-7398.
by Maine’s Black Dog Graphics and the Colby Volunteer Center. The students plan to wear the shirts, which sell for $10 each, on Feb. 5 to show their solidarity with Haiti. AmeriCares relief worker Bret McEvoy '05 is coordinating the distribution of medical aid for earthquake survivors — and blogging about his experiences. McEvoy is among a handful of AmeriCares relief workers who are posting from Port-au-Prince and throughout earthquake-affected areas of Haiti. I keep reading reports about problems in Port-au-Prince. Some of my colleagues have come across precarious situations, but it hasn't been my experience in recent days. Granted, our team tries to refrain from traveling at night, and we have local staff helping us to avoid certain pre-earthquake trouble spots. But that all being said, I have found nothing but warmth, hospitality and gratefulness in the Haitian people I have met and befriended. More from Bret McEvoy's blog here. On February 1, a group of students, faculty, staff, and members of the Brunswick community gathered in the Searles Science Building at Bowdoin College for a “Homage to Haiti.” This event was set up by the Latin American Studies Program at Bowdoin College. Five Bowdoin students described their experiences of being Haitian-American. Dr. Samuel Broaddus, a Bowdoin graduate from the class of 1973 and the Director of the Division of Urology at Maine Medical Center, spoke about the situation in Haiti. He has worked to improve medical care in Haiti for over thirty years and volunteers with Konbit Sante at Justinian Hospital in Cap-Haitian. Bowdoin Professor of History Allen Wells discussed Haiti’s history and visiting assistant professor Karen Lindo, spoke about Haitian literature. Bowdoin students Alain Mathieu and Kyle Dempsey shared ideas on how Bowdoin students and the community could become involved in helping Haiti. A screening of the documentary, "Poto mitan: Haitian women, pillars of the global economy" took place. A Bowdoin for Haiti Action Week is being planned to be scheduled at Bowdoin from February 21 through February 27. All proceeds from the events planned that week will be donated to Partners in Health and Konbit Sante. The newly-formed Bowdoin Haiti Alliance will focus on projects for long-term aid to Haiti. Tim Hart , a College of Education and Human Development instructional technologist at the University of Maine at Orono, and his graduate assistant, Jonathan Allen, used a marathon night of video gaming to raise over $800 in pledges for victims of the devastating Jan. 13 earthquake in Haiti. They played video games from 4 p.m. Jan. 21 to 4 p.m. Jan. 22 — 24 hours of nonstop gaming. Hart said around $810 has been collected in checks and cash for Save The Children’s Haiti Earthquake Children in Emergency Fund. More than 2,000 viewers tuned in to an online live-stream broadcast, according to their Web site, meg4c.com — which stands for Maine Gamers for Charity. Hart said viewers were from places as far away as the United Kingdom. The marathon took place in the computer lab in 35 Shibles Hall, to which Hart’s office is attached. It was live-streamed through an account on UStream.com. A homeschooled teenager from Pennsylvania watched the entire marathon and mailed money in, Hart said. A group of gaming enthusiasts from the U.K. logged onto the stream as well. Hart and Allen are “definitely” planning another marathon for early March with the goal of raising $1,000. It will again take place from a Thursday to a Friday. The pair plans to begin advertising for an additional two weeks before the event. Hart and Allen aren’t the only members of the UMaine community looking to make a difference in the Caribbean nation of nearly 9.8 million. Students Christopher Jander and Allison Dow are holding an informational meeting at the Wade Center in the Memorial Union on Feb. 4 at 7 p.m., according to a release from the UMaine Office of Student Organizations and Leader Development. The meeting will detail “what we can all do to make a difference” in Haiti. Even if you’ve already donated to another organization, show up in white for the game to show student support and unity! Any questions, comments, concerns, and/or suggestions can be directed to Amanda Gray on FC. 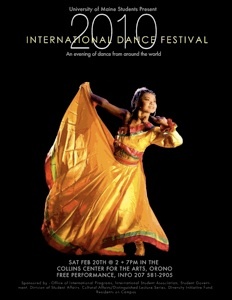 Various groups will be collecting donations for Haiti at the doors of the International Dance Festival at the Collins Center for the Arts at the University of Maine at Orono. The fund-raising event was co-sponsored by the International Students Association. Additional funding came from Division of Student Affairs, Cultural Affairs, the Diversity Initiatives Program, as well as UMaine Student Government and Residents on Campus. Proceeds from the benefit were donated to Konbit Sante.